On January 11, 1944, an F4F Wildcat, (Bu. No. 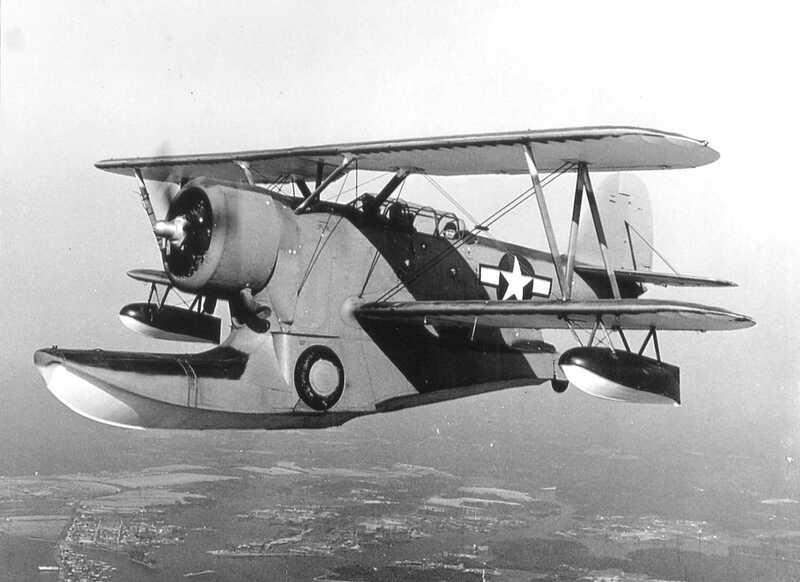 11863), with a target tow sleeve attached, was in the process of taking off from the Quonset Point Naval Air Station. At the time, the aircraft had been cleared by the tower for takeoff. When the Wildcat was about two-thirds of the way down the runway, a Grumman J2E Duck suddenly landed ahead of, and in the path of the Wildcat. To avoid a collision, the pilot of the Wildcat skidded to the left and went off the runway and plowed into a snowbank. 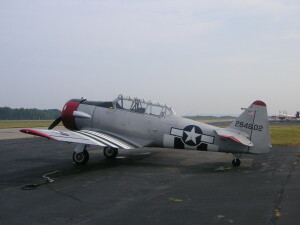 The pilot was not injured, but the Wildcat was in need of a major overhaul. Nobody aboard the other aircraft was injured. On June 6, 1944, a TBF-1D Avenger, (Bu. No. 24508), was landing at Quonset Point Naval Air Station after a training flight when the left brakes failed causing the aircraft to ground-loop at a high speed. Damage consisted a buckled wing and buckled rear stabilizer as well as a blown tire. The crew was not injured. The aircraft was assigned to VC-19. On the morning of May 23, 1943, a flight of six TBF-1 Avengers took off from Quonset Point Naval Air Station for a formation-practice bombing flight. One of those aircraft was Bu. No. 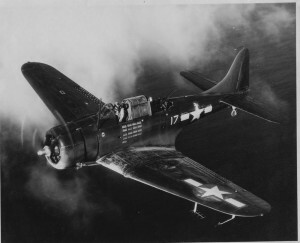 06123, piloted by Ensign Leon T. Gerhart, (22), of Pennsylvania. ARM3c Donald J. Cross, (20-21) of Wisconsin. Once airborne, the TBF’s rendezvoused with Ensign Gerhart flying in the No. 2 position. The bombing mission was carried out, with each aircraft making their run individually at an anchored target boat. At about 9:25 a.m., with the exercise completed, the signal was given to re-form. As this was taking place, Ensign Gerhart’s aircraft was involved in a collision with another TBF, (Bu. No. 47528). During the collision, the tail section of Gerhart’s aircraft was completely broken off, and his plane fell out of control and crashed in Narragansett Bay. All aboard were killed. The other aircraft (Bu. No. 47528) suffered damage to its right wing, but was able to successfully make an emergency landing at Quonset Point. Nobody aboard that aircraft was injured. Shortly before 10:00 p.m. on the night of May 31, 1945, Ensign George Robertson Miller was returning to the Charlestown Naval Auxiliary Air Field after a night operations flight. The wind was gusting strongly that evening as he approached runway 35 in his F6F-5N Hellcat fighter aircraft, (Bu. No. 78136). As he was coming in to land, a strong cross wind struck the aircraft causing it to crash. Ensign Miller was killed when the plane hit the ground. 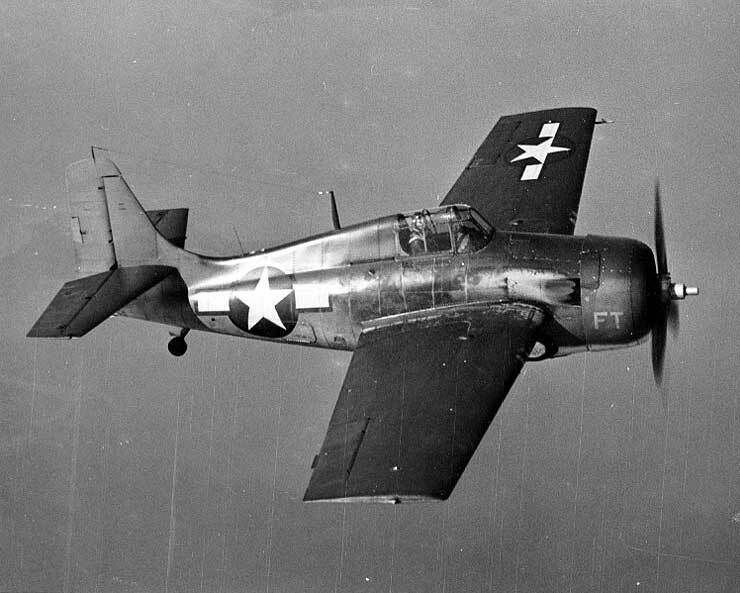 At 3:36 a.m. on the morning of March 29, 1945, an Ensign was practicing night landings and take offs at Quonset Point NAS in an F6F-5N Hellcat, (Bu. No. 71001). As the pilot was coming in to land, the right wing of the aircraft suddenly dropped and the plane rolled over and crashed into a wall. The aircraft was completely wrecked, and the pilot received lacerations, burses, and possible internal injuries, but he later recovered. On the morning of August 2, 1945, Ensign Walter G. Davies was cleared for takeoff from Runway 32 at the Westerly Auxiliary Naval Air Station. Just after becoming airborne the engine of his F6F-5 Hellcat, (Bu. No. 78413), lost all power and the airplane came back down on the runway. The plane touched down near the end of the runway. Ensign Davies applied full brakes but was unable to prevent the plane from going off the end of the runway and over an eight-foot embankment where it flipped over in trees and scrub brush pinning Davies inside. There was no fire, and Ensign Davies was rescued a short time later with no serious injuries. The aircraft was a total loss. The cause of the crash was blamed on faulty engine magnetos. Source: National Archives, AAR W6-45, TD450802RI, via Larry Webster, Aviation Historian, Charlestown, R.I.
On November 5, 1943, Lt. (jg.) 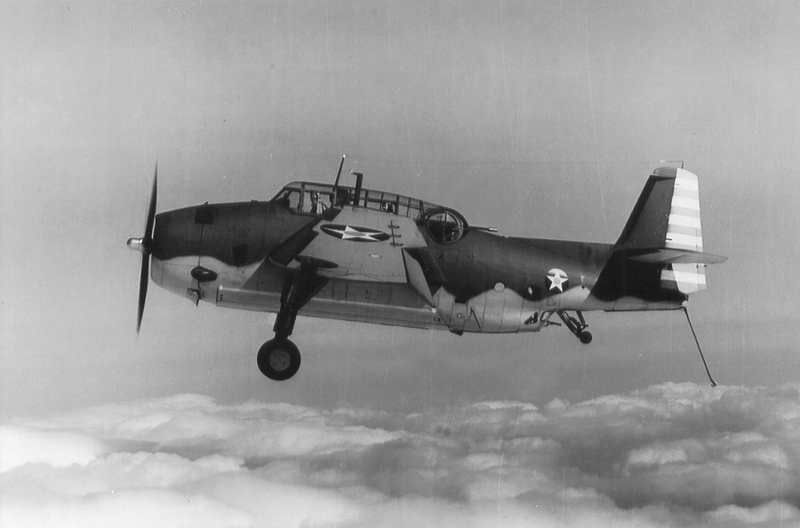 George E. Orenge was piloting an F6F-3 Hellcat, (#65895) on a test flight from Quonset Point Naval Air Station. At about 10:00 a.m. he came back to land at Quonset Point. After touching down on the runway, the left tire on the landing gear blew out causing the plane to swerve into an ordinance truck parked on the extreme edge of the tarmac. There were no injuries, but the aircraft required a major overhaul. 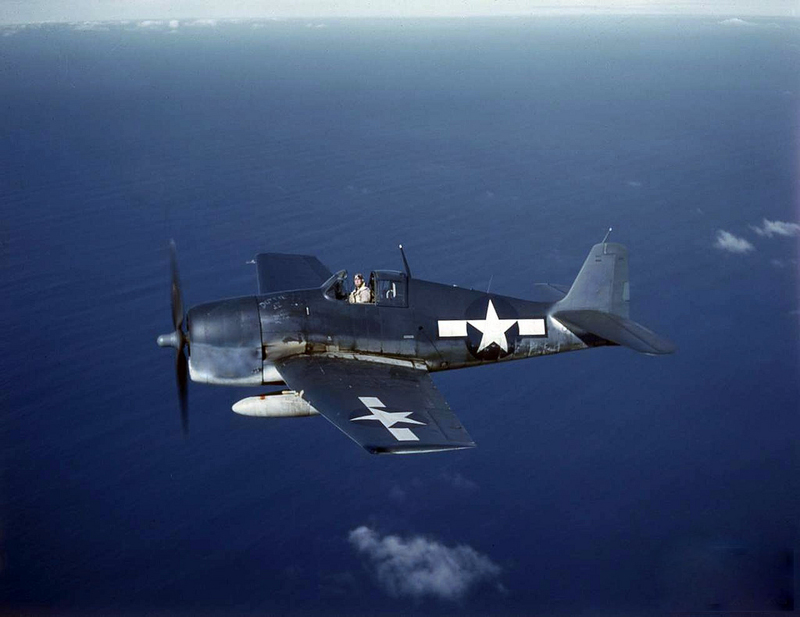 At 6:52 p.m., on October 26, 1944, Ensign Norman Francis Day, 20, piloting an F6F-5N Hellcat, (Bu. No. 70895), and Ensign W. D. Cochran, piloting another F6F Hellcat, took off from Charlestown Aux. Naval Air Station in Charlestown, Rhode Island, for a night training mission. The pair flew to Fisher’s Island, New York, (Off the eastern end of Long Island) and engaged in simulated strafing maneuvers on searchlight positions. After about 40 minutes, Ensign Cochran attempted to call Ensign Day by radio and got no response. A fisherman on a boat reported a plane apparently experiencing engine trouble had crashed into the water about 2 miles due south of Watch Hill, Rhode Island. Watch Hill is in the town of Westerly, Rhode Island. The crash was not witnessed by Ensign Cochran. At the time of his death, Ensign Day was assigned to Carrier Aircraft Service Unit 27, (CASU-27), assigned to the Naval Air Station at Charlestown, Rhode Island. He’s buried in Arlington National Cemetery. 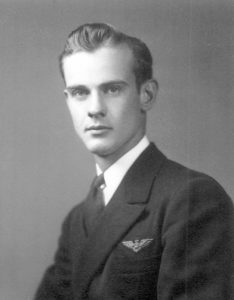 Larry Webster, Aviation Historian, Rhode Island. 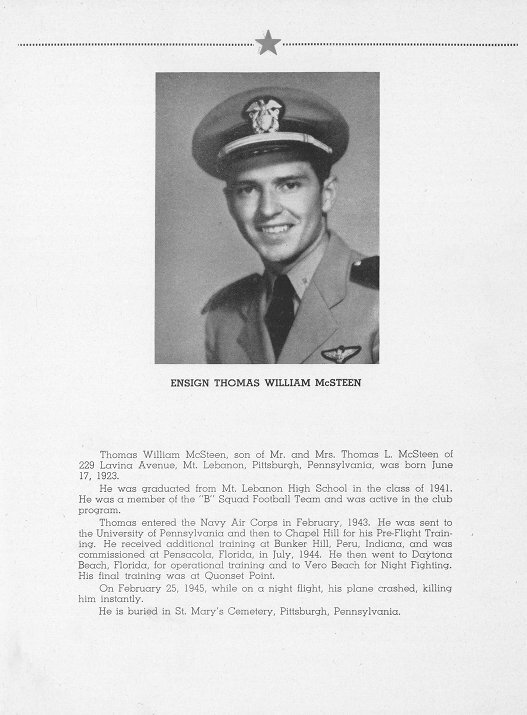 On February 25, 1945, Ensign Thomas William McSteen, 21, was killed when the F6F-5N Hellcat, (Bu. No. 70670) he was piloting crashed near Fox Island in the west passage of Narragansett Bay, between Jamestown and the mainland. 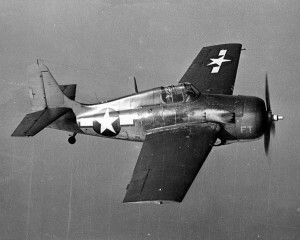 Ensign McSteen and three other Hellcat aircraft were taking part in a carrier landing training exercise at the time. After examining the recovered aircraft, investigators concluded the accident occurred as a result of engine failure. Ensign McSteen graduated Mt. Lebanon, Penn. High School in 1941, and enlisted in the navy in February of 1943. He received his Ensign’s commission and his pilot’s wings at Pensacola Naval Air Station in Pensacola, Florida, in July of 1944. Ensign McSteen was survived by his wife Margaret Elizabeth, who he married at Pensacola NAS on July 22, 1944. He’s buried in St. Mary’s Cemetery in Pennsylvania.